This blog is all about Halloween drinks, so it is time to start featuring some. I had found several that were really interesting before, so I want to get those here first. 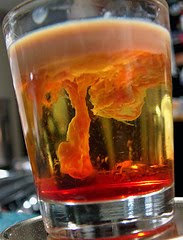 Check these out at Dabbled, the Brain Hemorrhage, as it is called, was originally from TangoPango. And this florescing martini, also from Dabbled, looks terrific! And be sure to check these out as well. This cloudy concoction is where it all starts. This is a new batch of pumpkin liqueur in the early stages. It starts out looking disgusting, but the final product is anything but. After basing my original recipe on the Bols Pumpkin Smash Liqueur, it disappeared from the market. So I went down the experimental path to reinvent it. In the end I was glad I went to all the work as I thought the Bols was too sweet and not the right spice balance. I scoured the Internet in search of recipes, and bought a book on making liqueurs called Classic Liqueurs. There was no pumpkin liqueur in the book, but seeing all the recipes gave me a great head start. It took 3 generations of trials, and each generation was split into 4 batch variations, initially focusing on the pumpkin flavoring. 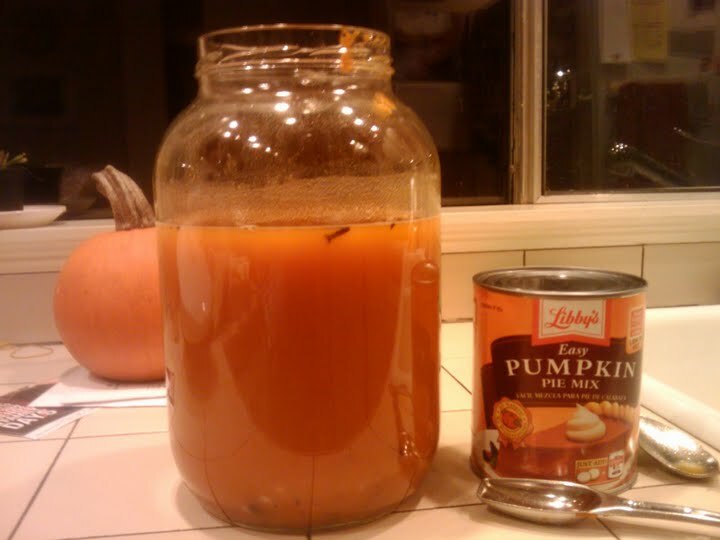 What I discovered along the way is that pumpkin by itself tastes like squash -- go figure. What we really think of as "pumpkin" is the spices that go along with the pumpkin. So it is better to call this Pumpkin Spice Liqueur. By the 3rd generation I was making good progress. I kept plying everyone around me with tastings, and I finally settled in on a recipe. It came out similar to Bols, but I like to think it tastes better. More flavoring (from actual pumpkin and spices) and not so sweet. Slightly higher alcohol content as well. 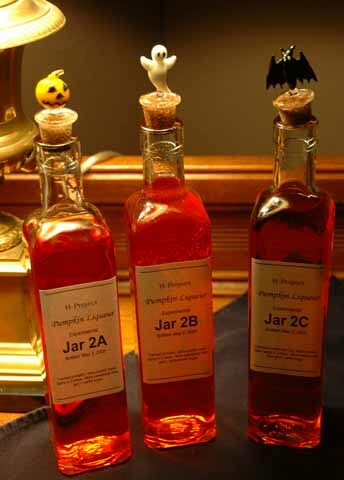 So here is the result from all my experiments, the recipe for pumpkin (spice) liqueur. I still tweak it a little each time, but this is where it stands now. You'll need a BIG jar. I use a big pickling jar seen in the pcture above. Clean and sterilize the jar and lid really well. Then toss in all the ingredients in the first part of the list. Stir/shake it around to mix well. Close up the jar and put it in a cool area to steep for two weeks. Stir/shake it every couple of days. After two weeks, we strain the concoction through a filter bag. I got mine from a beer supply place, not too fine at this point. I also clean the cinnamon sticks but toss them back in for the final phase. At this time, we also make and add the syrup. Put the sugar and water in a large pan and heat to boiling, stirring constantly. Let cool. Pour the syrup into the big jar and stir it up. Close it back up and put it back in the dark/cool location for three more weeks. Once again, stir/shake occasionally. After the 3 weeks, it is time to filter, finish, and bottle the liqueur. Filtering is tough. The Bols liqueur had a nice orange crystal clear look that I can't quite achieve. My current method is to use a gold coffee filter with extra paper coffee filters in it. This takes quite a while and you'll use many paper coffee filters before you are done. But it comes out nice when complete. I'm thinking now of breaking down and buying a powered wine filter, but I'll have to be making this much more often to justify it. The final finishing step is to add the glycerin, and the orange coloring. Then find some nice bottles to put your finished product in. The final proof should be somewhere around the neighborhood of 24% alcohol by volume or about 48 Proof. While it takes a little time, the result is well worth it. Welcome to the world's first blog dedicated to libations solely for Halloween! We'll be featuring all types of drinks, with and without alcohol. 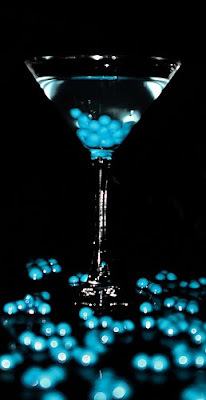 I started researching drinks for Halloween a few years ago when I was looking for pumpkin based martinis. I gathered as many recipes as I could find, then ended up melding them into my own recipe. The very next year after refining the recipe to perfection, Bols, the maker of the pumpkin liqueur I used, stopped manufacturing and distribution of the liqueur. I then set out to make my own pumpkin liqueur and it has been a hit among my friends. Since that time, I've created a new pumpkin martini, my personal favorite, called the Subtle Pumpkin Martini. I published the recipes for the drinks and the pumpkin liqueur in my Halloween blog TangleofWires, but now it is time for the Halloween drinks to take center stage.